Like others facing the challenges of aging, LGBTQ seniors deserve respectful, high quality health and human services. Lavender Seniors provides social support services that fosters a sense of belonging for all LGBTQ older adults. We also participate in local, statewide, and national advocacy efforts. 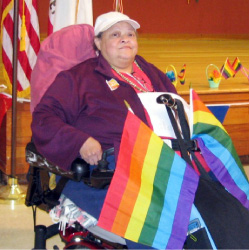 Our mission is to improve the quality of life of older lesbian, gay, bisexual, transgender, and queer (LGBTQ) residents of Alameda and Contra Costa counties. Lavender Seniors advances this mission through direct services, outreach, advocacy and education. A critical aspect of this work is ensuring that LGBTQ elders are well-prepared emotionally, physically, legally, and socially in their later years. 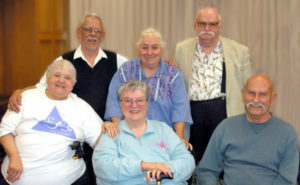 Lavender Seniors was started in November 1994 by a group of about 20 seniors concerned with a lack of services and legal protections for the “gay and grey.” Their original meeting held in San Leandro was the inception for creating our welcoming services as well as community change. The name Lavender Seniors came about because one of the original founders put the name on a sign to direct LGBTQ seniors into this first meeting. From that day on the group became known as Lavender Seniors of the East Bay. Since that first meeting we’ve been determined to stick together as LGBTQ elders. United, we are much stronger and better able to support each other. Lavender Seniors, therefore, warmly welcomes those who identify themselves as lesbian, gay, bisexual, transgender, those who are questioning their identities, and those who don’t identify with any labels. We also deeply appreciate the support of our heterosexual friends, relatives and allies. LGBTQ seniors came of age at a time when it was criminal and considered mentally ill and deviant to be LGBTQ. They often were beaten, fired from jobs; evicted from their homes; disowned by family, friends, and community; dishonorably discharged from the military; hospitalized in psychiatric wards; taunted and sometimes arrested and imprisoned. Thus, for most LGBTQ persons, the only way to survive was to be “closeted,” to hide their sexual orientation and gender identity from family, employers, neighbors, and officials, and attempt to “pass” as heterosexual. Because of remaining hidden, many older LGBTQ seniors still feel at risk. Many avoid supportive services all together for fear of outing themselves. Both fear and isolation can become a serious threat when an LGBTQ senior grows frail and vulnerable. It also is not uncommon for LGBTQ seniors to lack family support to aid in care giving. Federal Marriage Laws that discriminate against LGBTQ seniors can have a devastating effect on LGBTQ seniors. Access to social security survivor benefits, pension benefits, Medical and long-term care benefits and estate tax issues can leave a LGBTQ senior vulnerable to poverty and health disparities. Lavender Seniors addresses these social injustices by increasing access to supportive direct services and advocating through coalitions for the advancement of LGBTQ legal protections. Additional information about LGBTQ aging issues for Service Providers & Advocates.